Temp worker David Evans has been dreaming of Dr. Alun Kendrick ever since that one transcription job for him, because holy cats, that voice. Swoon. So when his agency offers him a position as Dr. Kendrick’s temporary office manager, David neglects to mention that he’s been permanently banished from offices. Because, forgiveness? Way easier than permission. Alun Kendrick, former Queen’s Champion of Faerie’s Seelie Court, takes his job as a psychologist for Portland’s supernatural population extremely seriously. Secrecy is paramount: no non-supe can know of their existence. So when a gods-bedamned human shows up to replace his office manager, he intends to send the man packing. It shouldn’t be difficult—in the two hundred years since he was cursed, no human has ever failed to run screaming from his hideous face. But cheeky David isn’t intimidated, and despite himself, Alun is drawn to David in a way that can only spell disaster: when fae consort with humans, it never ends well. And if the human has secrets of his own? The disaster might be greater than either of them could ever imagine. This is a charming faerie tale. When a human office temp is assigned to work for a cursed Sidhe warrior, the resulting chaos is very entertaining. The story moves between the human world and Faerie – between modern day Portland and the Seelie court. I loved Alun’s troubled supernatural patients as much as I loved David’s attempts to make Alun’s office a more colourful and welcoming place. When we meet David, he is cute and sweet and clueless about the supernatural world. He’s a little too perfect to be true but it works in a modern faerie tale. His innocent responses to Alun’s patients are brilliant and David brings joy and a sense of fun to Alun’s rigid world. Alun is the supernatural world’s curmudgeonly psychiatrist. After losing his lover two centuries earlier, he is irritable and miserable at the start of this story. I liked the way we see his kindness through his patient interactions and I enjoyed his reactions to David. The relationship between Alun and David is sweet and pretty low heat. This is a romantic comedy and some of their interactions had me laughing out loud. These two are great fun together and they fit well as partners. This author’s concept of Faerie seems to borrow heavily from Patricia Briggs and Laurell K Hamilton. There isn’t a whole lot of world building here and there is an expectation that readers will have some prior knowledge. 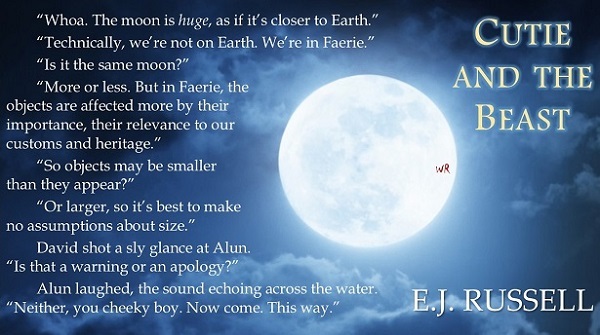 I followed this part of the story easily and I enjoyed the characters in Faerie. Beyond Alun and David, I really loved the supporting characters. Alun’s brothers are brilliant, David’s aunts are formidable and Alun’s patients made me smile. I’m really looking forward to the next books in this series. E.J. Russell holds a BA and an MFA in theater, so naturally she’s spent the last three decades as a financial manager, database designer, and business intelligence consultant. Several years ago, she realized Darling Sons A and B would be heading off to college soon and she’d no longer need to spend half her waking hours ferrying them to dance class. What to do with all that free time? A lucky encounter with Jim Butcher’s craft blog posts caused her to revisit her childhood dream of writing fiction, and now she wonders why she ever thought an empty nest meant leisure. Her daily commute consists of walking from one side of her office to the other, from left-brain day job to right-brain writer’s cave, where she’s learned to type with a dog attached to her hip and a cat draped across her wrists. E.J. is married to Curmudgeonly Husband, a man who cares even less about sports than she does. Luckily, C.H. also loves to cook, or all three of their children (Lovely Daughter and Darling Sons A and B) would have survived on nothing but Cheerios, beef jerky, and satsuma mandarins (the extent of E.J.’s culinary skill set). 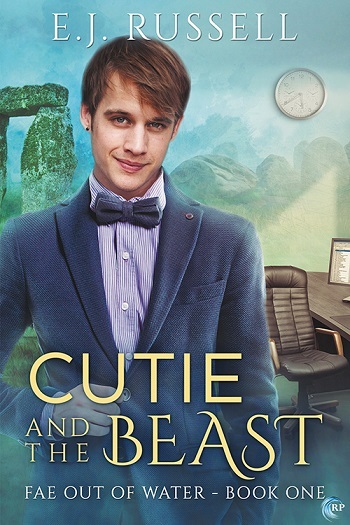 Reviewers on the Wicked Reads Review Team were provided a free copy of Cutie and the Beast (Fae Out of Water #1) by E.J. Russell to read and review.